I’m not Buddhist, nor do I practice Shintoism but if I’m in Japan at the dawn of a new year I always visit one (or several) of the temples and shrines scattered throughout the country. I love the beauty, serenity, history and traditions associated with each site. 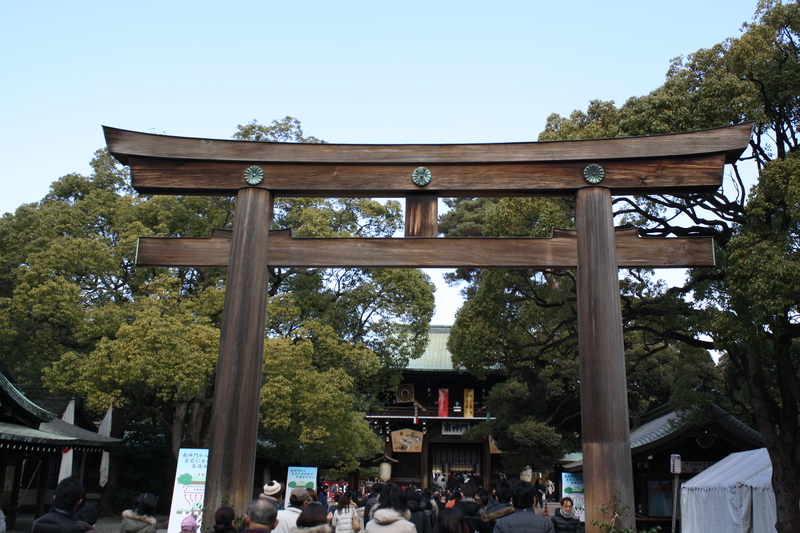 In Tokyo the very popular Meiji shrine is my favorite. Surrounded by a forest, the shrine is a quiet oasis in the middle of the busy city. 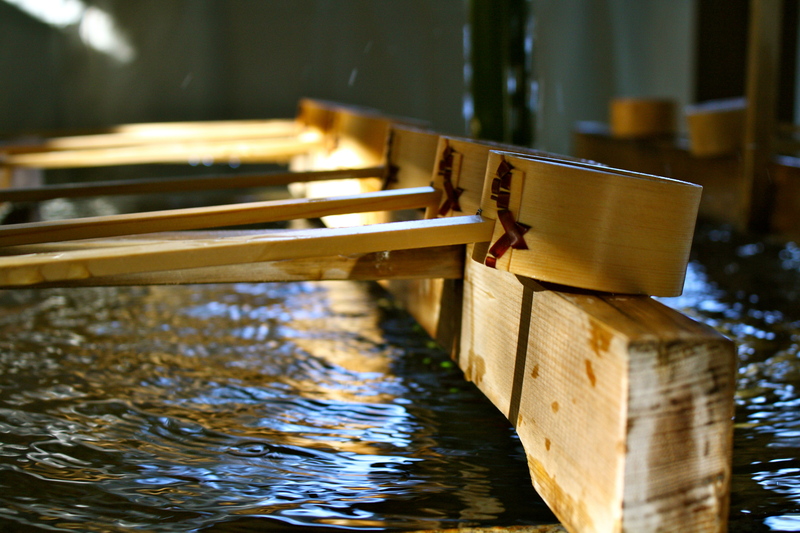 If I’m in Kyoto, I refuse to leave without a visit to the Inari Shrine, easily one of my top ten places in the world. I can spend hours meandering under the thousands of bright orange torii gates that wind up and down the graceful mountain, pausing occasionally to sip tea at one of the tiny teahouses that dot the trail. 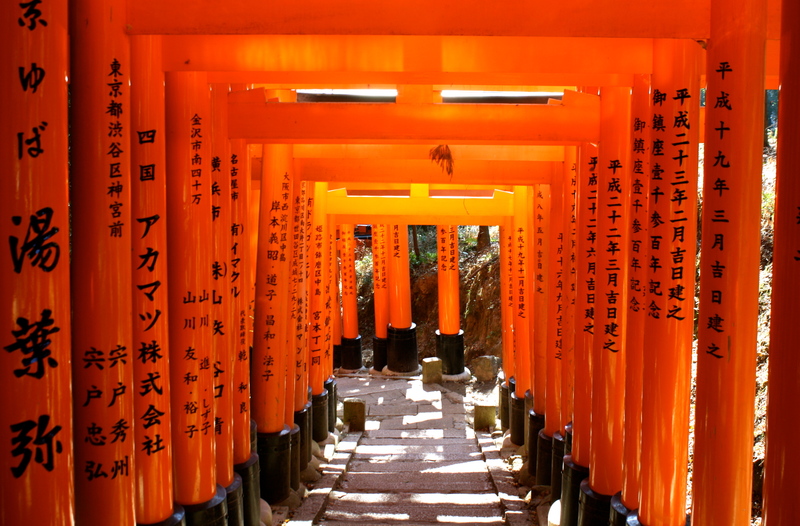 The startling contrast of orange and black torii gates against the surrounding forest is mesmerizing. 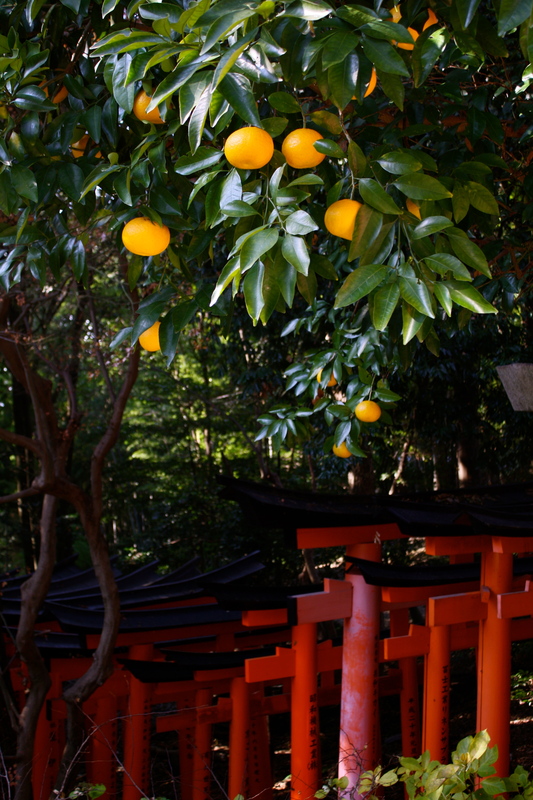 The occasional yuzu tree adds a layer of enchantment, the golden yellow citrus fruit perfuming the crisp air with hints of grapefruit and orange. No matter which shrine you visit, allow yourself to be carried with the crowd towards the center structure. When you get there, toss a few coins into the metal offering box before clapping twice and bowing your head in brief prayer (I spotted many people skipping the traditional opening double bow so you can too). But before doing so, pause at the pit of burning incense and guide the fragrant smoke, believed to possess healing powers, over any ailing body parts. One of my favorite aspects of each site are the different ceremonial cleansing water fountains. 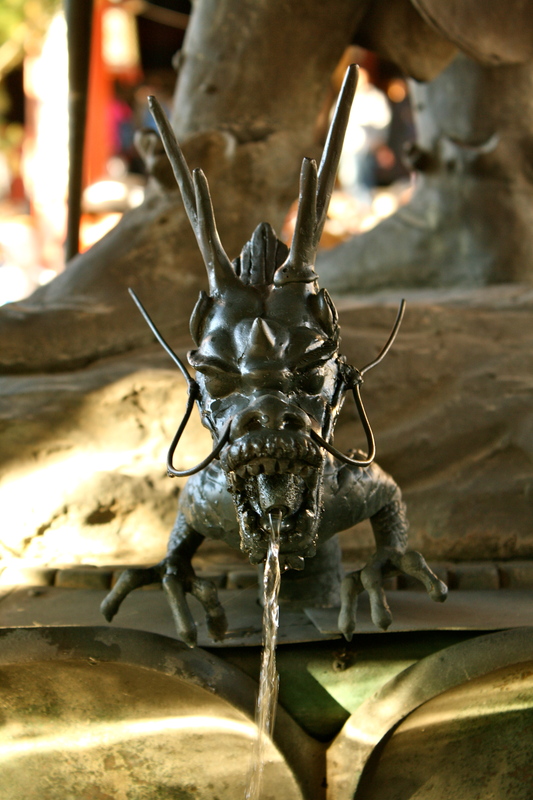 I love the variations of spigots, typically dragons or bamboo, delivering cool water for visitors to purify their hands (and mouth if so desired) before entering the shrine or temple. 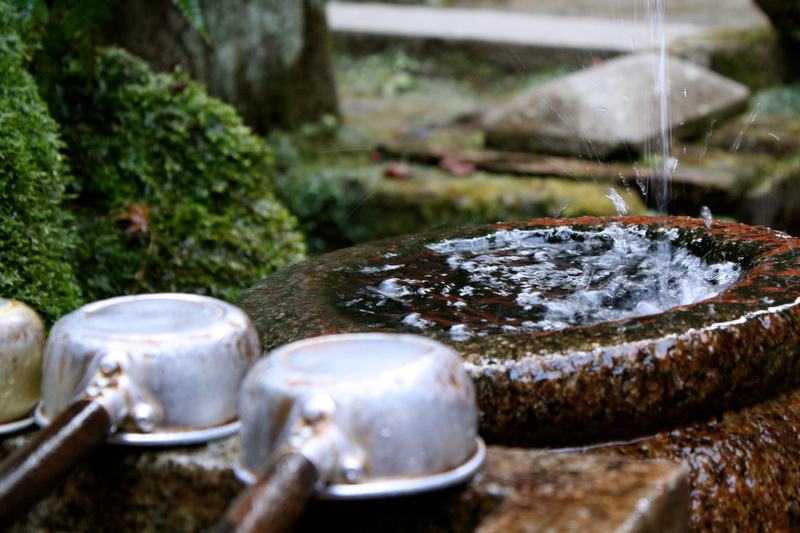 When hiking through the Inari Shrine in Kyoto you may hear the faint sound of running water and then spot a stone vessel overflowing with cold mountain water that’s streaming out of a bamboo spigot. 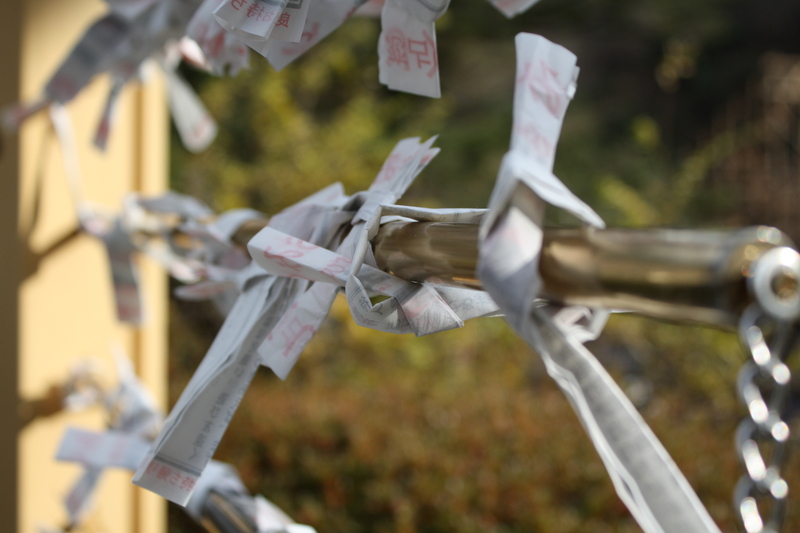 After all the praying and cleansing you might be feeling pretty damn good about your prospects for the new year, so this would be a great time to buy a omikuji—a piece of paper predicting your fortune for the upcoming year. These are not the pleasant blow-smoke-up-your-bum fortunes found in cookies of a disconcerting yellow hue at the end of (American) Chinese meals. Some can be good, but others can be pretty harsh. 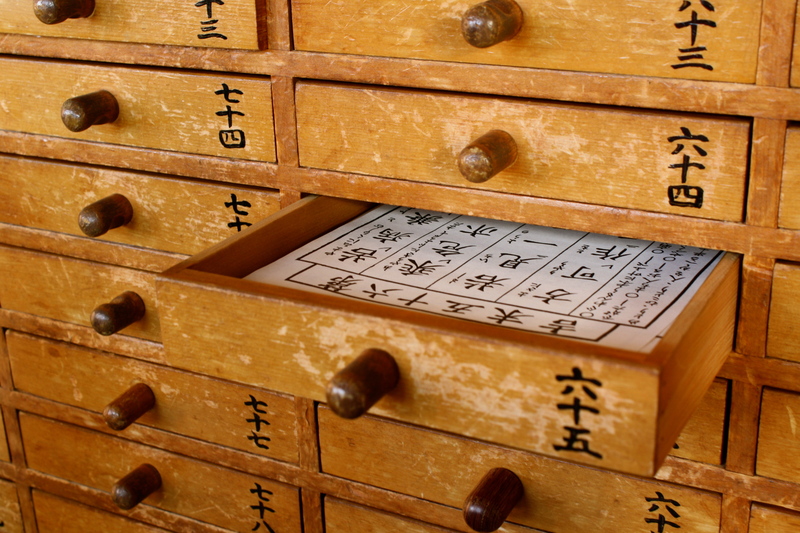 If you do get an unwanted fortune, don’t stress. 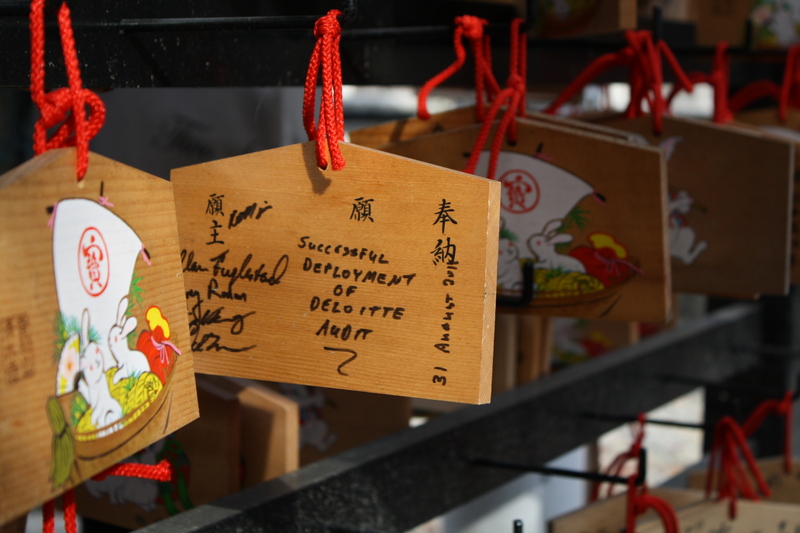 Simply follow the example of others and tie your fortune up around a nearby tree branch or pole so it can’t follow you around in the new year. Off to one side you may spot a large board with hundreds of tiny plaques, called ema, hanging from it. 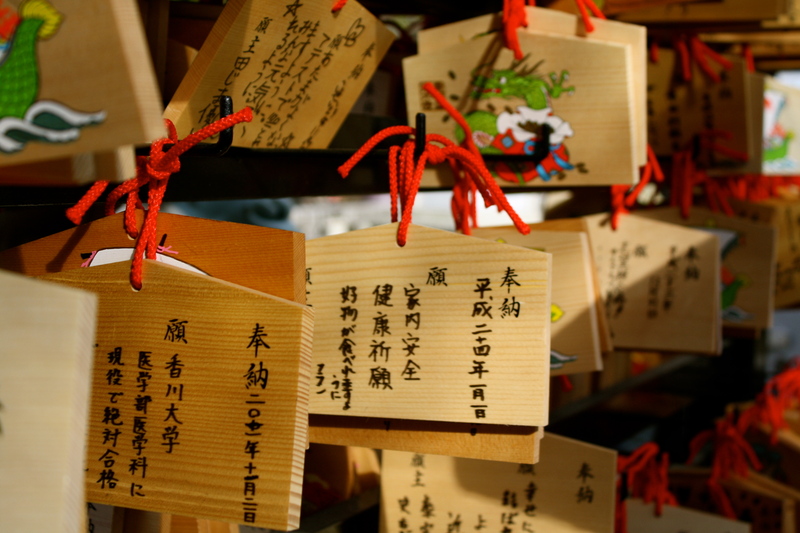 Visitors write prayers and wishes on the back of these plaques and leave them at the shrine in hopes that the kami (gods) will receive and grant the wish. 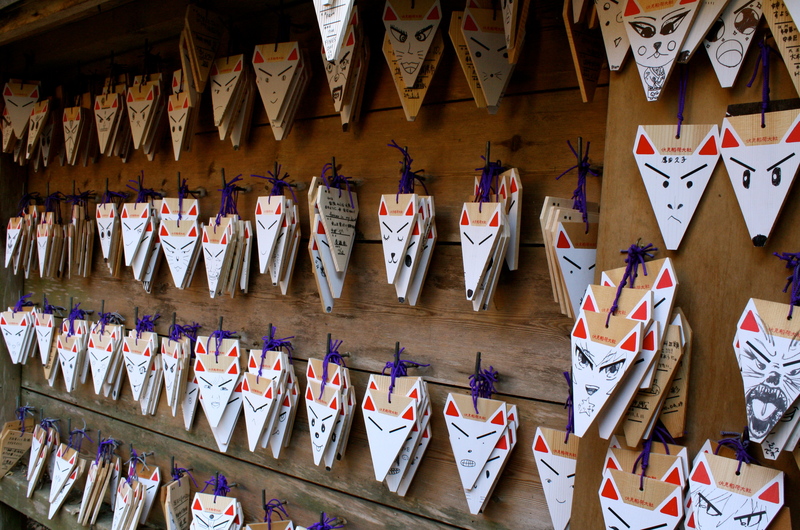 The plaques at the Inari Shrine are in the shape of a fox head (the Inari Okami or Inari god is a fox… go figure) and visitors can personalize their plaque further by drawing whatever face they want to on the front. If you are worried you’ll forget the proper etiquette for washing, bowing, ringing bells and praying, don’t be. No one will judge you for taking cues by peeking at those around you, or if you opt not to do any of those things at all. Just go. Watch. Follow. Get lost. Stand still. Wander around. You won’t be disappointed. Nice pics! Interesting how at the end of the day, or year, people everywhere tend to look up for the divine blessing to help us through. It’s a beautiful country and culture and you have captured a small but powerful glimpse of it here. Well done!